With just over 2 weeks left to go before the move, the packing has begun in earnest. I’ve been carefully packing up and tucking away, getting everything ready for the long trip ahead. My office is half packed now, and is quickly shifting from workspace to cardboard city. 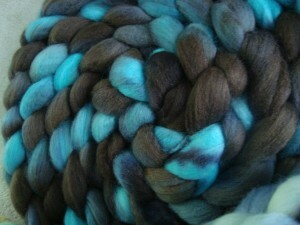 I haven’t packed the dye studio yet, because there are a couple of things left that I want to dye before we go. So, we’ve been looking at other options for places to dye. Right now, it’s looking like I’ll probably use Mike’s (of the Mike sweater) garage, but he’s over an hour drive away. That means that dye days will require more planning, and will likely not happen as often. I’ve been thinking hard about what this means for DesigKnit, and especially for the Etsy shop. I have a lot of stock left from the show, and I am planning to use that to slowly populate the Etsy store, mostly after we finish the move. 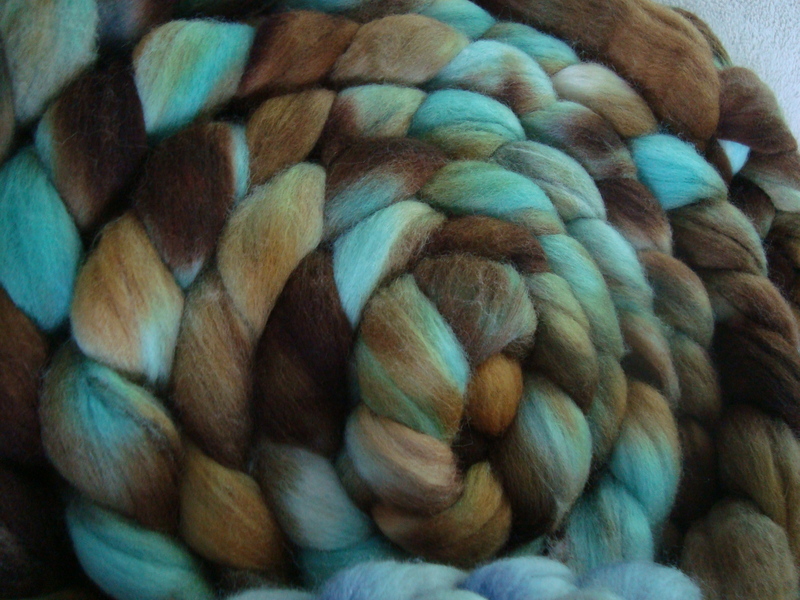 After that, I’m hoping to do a dye day once every month or two, focusing on dyeing from pictures like I’ve done before, since that’s the most fun. That’s 3 lbs of Finn for a sweater for Branden that I’ve had percolating in the back of my mind for at least a couple of years now. 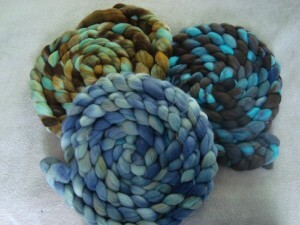 Each colorway will be a different ply, which should make for a very interesting barberpole yarn. The second is a slightly brighter mint green, with accents of a yellow-brown. And the third is mostly black and gray with bursts of turquoise. I also dyed up 4 oz of Rambouillet to go with the BFL-silk singles from the Fiber Optic top that I bought at GreenCastle. I spun the Fiber Optic expecting to chain ply it into a three-ply, but the more I thought about it the more I wanted to stretch the yardage. Most of the handspun skeins languishing in my stash are there because I don’t have quite enough yardage to do this thing or that thing, and I want this to be a yarn that I’ll use right away. I didn’t want to do a random 2-ply, because I wanted the color repeats to stay separate. After a few days of mulling it over, I started thinking about maybe mixing it with another color, preferably something dark and mostly solid that would stand back and let the BFL-silk be the real star of the show. Then I started thinking about Jocelyn’s experiment with woolen and worsted spinning, and how much I liked the yarn she’d gotten. 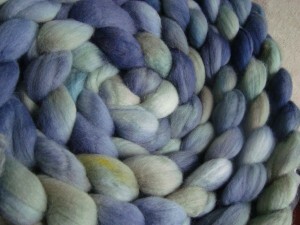 Of course, I hadn’t spun the BFL worsted, but I think I might be able to get a similar effect here. 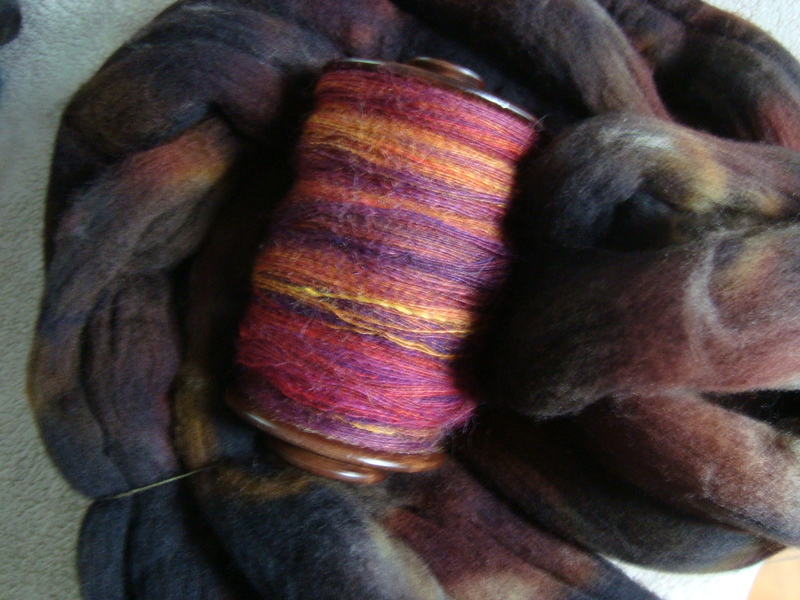 So I dyed up some deep, dark brown to match, and I should end up with quite a lot of 2-ply laceweight by the time I’m done. Isn’t it interesting how the brown dyes separated in spots to give reds and oranges that pick up the colors in the Fiber Optic? I really like the turquoisey colors with the other darks and blues. What style sweater will this be? Well. it’s like you said before–you don’t have to stay at this house forever. I guess it’s nice that you are renting so if you don’t like something you can stay a while and move on. Since dyeing is such an integral part of your life I’d hate to see you having to drive a long way to do this. What about Simmons? Is there a tiny little corner in a lab somewhere there where you could dye? I really hate to see you go but am quite excited for your new life!! Brandon’s sweater yarn looks interesting. It will be neat to see how they end up working together. I love your idea for the Fiber Optic fiber. I think those two will go together well. It’s too bad your landlords don’t seem open to your dying, but I suppose they’re worried that you might make a real mess of things. The new colors are pretty! It will be interesting to see how they spin up. It hurts to hear that you won’t have a dye studio, you’re so good at it. I learn something every time I read your blog. Thanks for that! And I love the brown with the brights — so rich! DesigKnit is powered by	WordPress 4.8.9 . Page generated in 0.503 seconds using 35 queries.